The used Solax mobility scooter for sale is in like-new condition have been ridden only one time. This automatic folding scooter chair folds and unfolds automatically operated with a remote control. There is no breaking down into parts and pieces for storage. This type of chair is ideal for individuals who cannot manage folding their scooter manually. This Solax has a maximum weight capacity of 300lbs and is TSA and airline approved for air travel. The compact design makes it great for maneuvering in tight spaces. It comes with a lithium battery and charger. The weight of the scooter is just 50lbs. 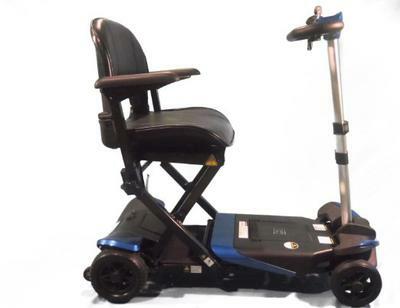 You can get a complete list of specs for the Used Solax Mobility Scooter for Sale at Gosolaxscooters. My price for the Solax is $1,795 which is a considerable discount, far below their discounted sale price. At this price it won't be around long, email me , Andrew, using the comments form provided by GoGoCycles Used Motorcycles for Sale.